Custom Silver Anniversary Jacket for Half Marathon registrants*, custom technical t-shirt for 10k registrants. Race fee includes chip timing, water, sports drinks, post race food, and beverages. Fan Zones and music along the course to keep you pumped up! * Register by 4/1 and sizes selected are guaranteed and jackets will be available at packet pickup. For those who register after 4/1, jackets will be available on race day AFTER THE RACE based on size availability. If you do not receive a jacket on race day we will take your name and a jacket will be ordered. **Registration fees are non-refundable and non-transferable. 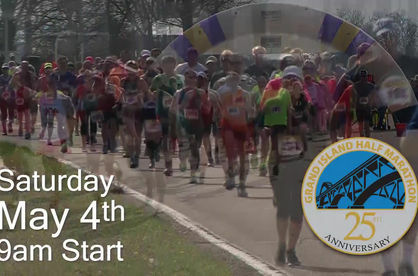 Packet pickup for the 25th Annual GBTC Grand Island Half Marathon & 10k will be on 5/3/19 at Flying Bison Brewing Company from 12pm – 7:30pm. Day of race packet pickup and registration is available from 7am on Saturday May 4, 2019 at Beaver Island State Park. Due to restrictions of keeping the course closed to traffic, runners must be to the half-way point by 1 hour and 30 minutes. Runners not at the half way point at that time will be picked up by sweep vehicle and driven to the finish line. The overall male and female finishers, the top masters finishers and the top three in each age division. 0 – 14, 15 – 19, 20 – 24, 25 – 29, 30 – 34, 35 – 39, 40 – 44, 45 – 49, 50 – 54, 55 – 59, 60 – 64, 65 – 69, 70 – 74, 75 – 79, 80 and up. Take the Beaver Island exit off the I-190. Follow signs to the park. Free admission to the park for all runners and their families. Veer left as you enter the park to access Area 1 for parking and pre/post race activities at the River Side shelters, Marina North and South.